Alia & David | Love It or List It Galleries | Merit Kitchens Ltd.
Alia and David purchased their first home together in a suburban area. It was within their price range but in major need of repair and updates. They wanted one, preferably three, new bathrooms, a new backyard, laundry room and additional storage in order to fall back in love with their home. 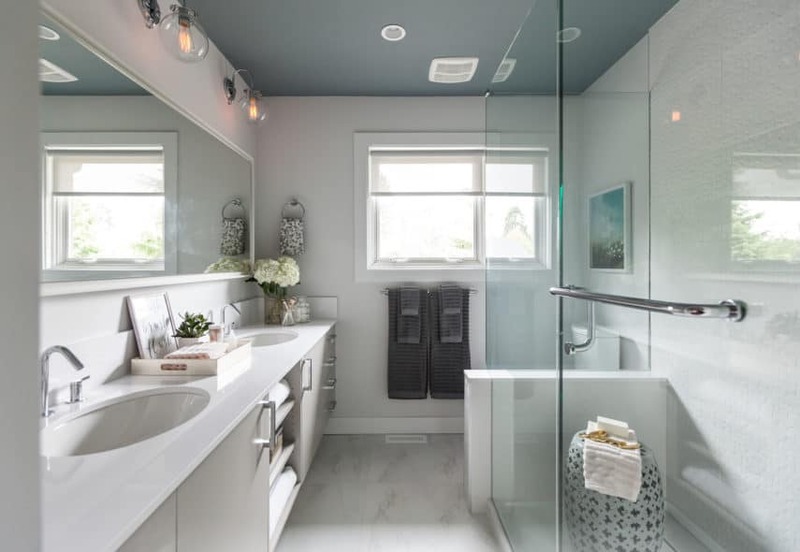 With the help of the team, Jillian and her team at Love it or List it Vancouver managed to pull off an amazing back yard and two gorgeous bathrooms. The vanity in the master ensuite was replaced by a custom-built unit from Merit Kitchens. Additional Features: This kitchen features a generous, double-sink vanity with ample drawer storage. The open shelf not only provides easy access to towels, but is also a visually attractive addition to the space. The cabinet door style is easy to clean and care for, and its soft grey paint colour complements the Bianco Calacutta floor tile beautifully.